Wired for Mackie: Piper is home! Piper is home! Can you even believe it? Ah, the power of prayer! Just amazing! Poor little Piper doesn't want to go outside. She probably never wants to see the outside again. Thank God for everyone who played a part in getting this girl back home. Thank Dog and all you angels who helped this sweet little giwl get home and heal. Hew bwavewy and tewwiew will awe amazing. Pipew. Stay inside and get well and keep wagging that bootiful tail and giving and getting kisses.I am doing a vewy big happy dance. You awe still in my pwayews and thoughts. We are doing happy dances and drying our tears at the same time, Piper! We are so happy for you! I am glad Piper is back home with you too, Cheryl. It's heartwarming to hear that she wagged her tail when she saw you, the other dogs, and her crate. I'm not surprised she doesn't want to go outside after imagining what she endured. I know you will keep her close and safe. Piper is truly a special girl that has the love and support of many of us who have not even had the joy of meeting her. 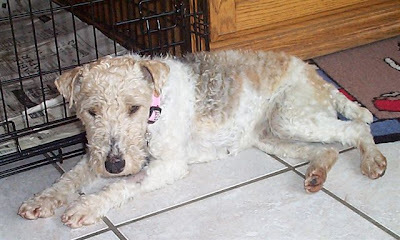 I don't know if you've ever had a mascot to represent Wire Fox Terrier Rescue, but I would vote for Piper in a heartbeat. Give Piper a gentle hug for me. Great feeling to read this incredible story! it always bothers me that I can never find email addresses for people when they respond to my bloggie so I never know how to answer them...so if you want me, email me!! heheheheh! Handmade Collar Bandana's and Other Dog Stuff---Mackie and Finnegan's Favorite. 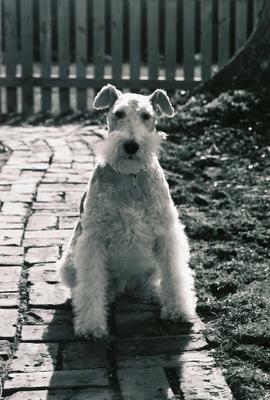 She has wonderful fox terrier prints and a portion of the proceeds got to Fox Terrier Rescue MidWest! Click on the logo above! Dean-O!- My wiry Canadian pal! The Search for Piper Continues! Piper--"This was an excellent day!!!"